Console style mixer/amp, 20 channels with XLR mic inputs plus stereo line inputs on channels 19 & 20, 60 mm faders, 4 band EQ with mid-morph technology, 2 monitor sends, 1 EFX send, pan pot, PFL and Mute switches. Dual 600W @ 4 ohm Class D power amps, 2 combo (Speakon and 1/4") connecters per amp channel, digital EFX (w/footswitch defeat and tap function). Auto EQ feature (with dedicated RTA input), Feedback Ferrets and digital graphic EQ's that are dedicated to each amplifier. Five power amp modes, including fully active subwoofer crossover. Full color box. 11" x 15" x 2.75"
Packed Dimensions(W x H x D): 3.75" x 8.5" x 10.5"
Dynamic cardioid microphone designed for stand-mount application. On/off switch. Clean, natural sound. Low pop and handling noise. Solid Zinc die-cast body. Low-gloss black finish. Includes carrying pouch, mic clip and 6 meter XLR cable. Frequency Response: 80Hz-12000Hz. Sensitivity: -53dBV/PA (2.2mV/PA). Output Impedance: 500 ohms. 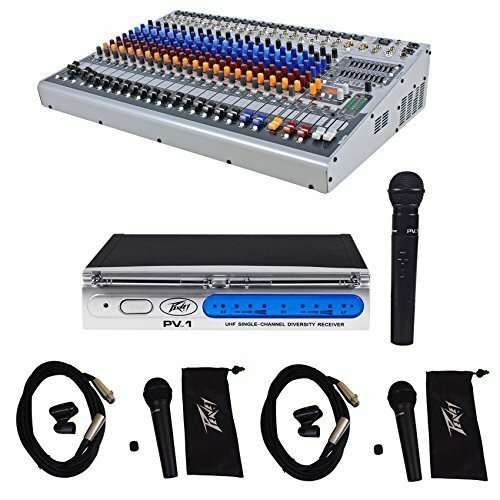 Packed Dimensions(W x H x D): 3.75" x 8.5" x 10.5"
Console style mixer/amp, 20 channels with XLR mic inputs plus stereo line inputs on channels 19 & 20, 60 mm faders, 4 band EQ with mid-morph technology, 2 monitor sends, 1 EFX send, pan pot, PFL and Mute switches. Dual 600W @ 4 ohm Class D power amps, 2 combo (Speakon and 1/4") connecters per amp channel, digital EFX (w/footswitch defeat and tap function). Auto EQ feature (with dedicated RTA input), Feedback Ferrets and digital graphic EQ's that are dedicated to each amplifier. Five power amp modes, including fully active subwoofer crossover. Full color box.